This week in our series, Steve Ember and Shirley Griffith continue the story of Thomas Jefferson's second term as president. In the early eighteen hundreds, Britain and France were at war with each other. The United States remained neutral. President Jefferson did not want to become involved in a war. He believed it would destroy all the progress he had made. His economic policies had helped to pay much of the national debt. And he was able to reduce taxes. Staying neutral was not easy, however. The United States was having trouble with Britain. For many years, Britain had been taking men by force to serve in its navy. The custom was called 'impressment.' Britain claimed the right to impress -- or seize -- any British citizen, anywhere. Conditions in the British navy were not good at that time, and many sailors deserted. Some went to work on American ships. The American ships were stopped and searched in British waters. Anyone born in Britain was seized. Several thousand sailors were taken off American ships during the early eighteen hundreds. Sometimes, American citizens were taken by mistake. Impressment was one of two major problems the United States was having with Britain in the early eighteen hundreds. The other problem was trade. Britain wanted to stop the United States from trading with France and its colonies. British warships blocked the port of New York all through the year eighteen-oh-five. No American ship could leave without being searched. When goods for France were discovered, the ship was taken to Halifax on the coast of Canada. There, a British court had the power to seize the goods and force the ship's owners to pay a large amount of money. President Jefferson protested this interference in American trade. He sent James Monroe to London to negotiate a treaty. Jefferson wanted Britain to stop taking sailors from American ships, and to stop interfering in the trade of neutral nations. Monroe tried many times to discuss such an agreement. But the British foreign minister was always too busy to see him. In Washington, Congress decided to act and not wait for a treaty. The House of Representatives debated two proposals. One proposal would stop all goods from being imported into the United States from Britain and its colonies. Imports would be permitted only after Britain had answered America's protests. The representative who offered the proposal said: "We do not wish to destroy the ties that ought to join nations of the same interests. To prevent this, we want an agreement that will satisfy both the United States and Britain. But if Britain continues its hostile acts, then we must loosen these ties of friendship." Some members of Congress felt that this measure was too extreme. They believed it might lead to war with Britain. The second proposal was more moderate. It would ban only those British goods which could be gotten from other places. The House of Representatives debated the two proposals. After four months, it finally approved a ban on the import of some British goods. President Jefferson did not want the trade ban to last long. He pressed for an agreement with Britain. He sent William Pinkney to assist James Monroe in London. The two diplomats were told to make clear to Britain what it must do to end the limited ban on British imports. Britain was to stop taking sailors from American ships. It was to stop interfering with trade between the United States and the colonies of France. And it was to pay for all property seized from American ships. Monroe and Pinkney knew they could never reach an agreement if they obeyed their orders. So they decided to negotiate on their own as best they could. They dropped the demand for payment for seized property. And they accepted a note -- separate from the agreement – about impressment. The note promised that Britain would be careful not to seize any more American sailors. At the end of December, eighteen-oh-six, Monroe and Pinkney sent word to Washington that the treaty was ready. But from the way their note was written, it seemed the treaty might not be satisfactory. Secretary of State James Madison wrote back. He said if the two diplomats could get no clear agreement on the question of impressment, then the talks should end without a treaty. But it was too late. Monroe and Pinkney had signed the agreement. But it was too late. Monroe and Pinkney had signed the agreement. President Jefferson was angry. His negotiators had disobeyed his orders. He refused to send the treaty to the Senate for approval. And he said he would tell Monroe and Pinkney to re-open negotiations. Before that could happen, an incident added more fuel to the diplomatic fire. A British navy ship attacked the American Navy ship Chesapeake while looking for deserters. Britain believed that some of the deserters were on the American ship. The United States said the men were American citizens who had been forced to serve in the British navy. It refused to return them. When the Chesapeake sailed out of American waters, the British ship tried to stop it and search it. The American captain did not stop. The British ship first fired two shots in front of the Chesapeake. Then it fired all its guns directly at the American ship. The Chesapeake was able to answer with only one gun. The American captain surrendered. News of the British attack spread quickly. President Jefferson ordered all British navy ships in American waters to leave at once. He told citizens not to aid them. And he said any person -- American or British -- who disobeyed his orders would be arrested. 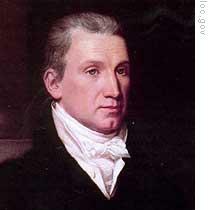 In London, James Monroe protested the attack on the Chesapeake. But the British foreign minister did not want to talk about the incident. Monroe saw little purpose in remaining. So he sailed for home. A few days after he left London, the British government announced a new rule. It said any American ship sailing to Europe must stop first in Britain to get permission. Ships violating the rule would be seized. Relations between the two countries had reached the breaking point. When President Jefferson learned of the new rule, he called a cabinet meeting to discuss the crisis. He said the United States had three choices: Go to war with Britain. Stop all trade with Europe. Do nothing. Jefferson supported the second choice -- a total embargo -- no trade with Europe. The president sent a special message to Congress. He proposed that no ships be permitted to enter the United States, and no ships be permitted to leave. Both houses of Congress approved Jefferson's proposal. He signed the measure in the closing days of eighteen-oh-seven. Jefferson later explained why he thought the embargo was the best choice of action. He said if American ships had sailed out of American waters, they would have been seized by Britain or France. That would have forced the United States into war. Jefferson said: "It was far better to stop all communications with these nations until they returned to some sense of justice." Jefferson's decision, and continuing tense relations with Britain, caused problems through his final days as president. The situation did not improve for America's next president, James Madison. That will be our story next week. Our program was written by Frank Beardsley. The narrators were Steve Ember and Shirley Griffith. Join us each week for THE MAKING OF A NATION – an American history series in VOA Special English. Transcripts, podcasts and MP3s of our programs can be found at www.unsv.com. 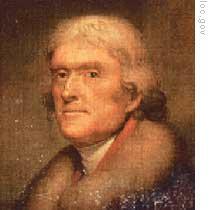 In the second presidency Tomas Jefferson faced many troubles. One of them coped the relationship between Britain and America. Jefffson decided to suspend trade with Europe, in this way America could avoid the war with European countries. another war could take place between the United States and Britain . we could foresee it in being at daggers drawn between them ,with the Britain 's sezing the sailers of America and America's reaction of ' embargo' policy. it would be ravishing !! At early eighteen hundreds, America was at its begining phase, it's not powerful enough. It's not completely independent at least in terms of trade.